We are currently requiring a 2 to 3 week lead time for custom products. Any order required sooner will be subject to a rush charge. If a specific date is required be sure to fill in the required date field in the Billing Address Information section. Prices for custom items will be verified by a customer service representative before an order is prcessed. Customers will be notified of any price differences before credit card payments are submitted. Two tone wedding bands must be at least 7mm wide and are only available in gold and platinum, no silver. Please select both metals and indicate which metal is for the center and which is for the rails. For two metal initial pendants use the primary and center metal columns. When ordering an engagement ring for your stone, please include type of stone, it's shape, size and dimensions. Please note that at least a 50% deposit is required to start all orders. Sorry, no personal checks, business checks or American Express. When ordering an item please provide descriptive information in the product information box below. Also type any questions you may have. Use the other text boxes where appropriate for the item you are ordering. Product ID's only relate to instock items. Rush orders are subject to an additional rush charge. Custom items, rush fees and shipping are not refundable. A restocking fee applies to all returned items. Orders may be cancelled within 3 business days at no penalty. deSignet International gladly accepts returns of stock items within 30 days of original shipment. Ring sizes smaller than 5 or larger than 12 are considered custom and non-returnable. Customers outside the USA are responsible for all taxes and duties levied by country of destination, plus UPS and FedEx brokerage fees. All orders outside the USA and Canada require payment in the form of a wire transfer, bank drafts or PayPal. Wire transfers under $500.00 are subject to a $10 fee. If you are from outside the USA please use this form to place your order. If you wish to ship to an address that differs from your billing address a signed release is required. Click here for our printable shipping release form. Please fill out completely and fax back to your sales person. Call us if you have any questions at 888-727-8266. All orders will be shipped to the billing address unless we have a shipping release form. Interested in placing an order? US and Canadian customers placing Credit Card or Paypal orders may use our on-line credit card order form. Non US and Canadian customers wishing to place orders using bank drafts, cashier's checks, wire transfers or paypal should use our on-line non-credit card order form. Have a question or just prefer to place your order by phone? Our customer service representatives are available Monday thru Friday 9AM to 5PM and 9AM to 2PM on Saturdays (Eastern Time). Give us a call us at 888-727-8266 or email us for more information. If you are having any trouble using our site or placing an order, please let us know. Email or phone our customer service representatives at 888-727-8266. We apologize for any inconvenience and thank you for your patience. Secured by Authorize.Net Merchant Services. For more information choose from one of the following categories. Can I have my custom design engraved? What finishes are available for my design? Will deSignet help me find the perfect diamond or gemstone for my custom ring? Can I have my stone set in my design? What should I know about metal composition? What is the best metal for my design? How will I know what a custom piece will look like before ordering? What if I need my order in a hurry?? What additional fees might I be charged?? How long does it take to receive an order and how is it shipped? How can I be sure my ring is sized correctly?? How does deSignet International price wedding bands? Do you offer a volume discount schedule? Will deSignet work with my company or organization to develop a custom line of jewelry?? Do you offer any customer incentive programs?? What is the average cost of a plain or stock patterned wedding band? Who owns the rights to custom graphics which deSignet International creates? What is your privacy and security policy?? What is your return policy?? What is your return policy on wedding bands? What is your policy on warranties and guarantees? Tell me something about deSignet. How long have you been in business?? Do you have a store front and what are your hours? How can I contact deSignet? Do you have a site map of your website? Do you have any current job opportunities? What are the current rates of exchange? Looking for an engagement ring? Planning a wedding? Interested in shopping our current inventory of diamonds and other gemstones?? Do you offer any customer incentive programs? We currently have several customer incentive programs running involving diamonds, gemstones, engagement and wedding rings. Please call our friendly staff at 888-727-8266 for more information about our current incentive programs. How can I be sure my ring is sized correctly? We recommend having your fingers sized at a jewelers before placing an order. Try on the same width comfort fit rings that you are interested in and ask the jeweler to write the size and width on the back of his or her business card. You do not need to tell them that you are planning on purchasing your rings elsewhere - we have had customers purposely sized incorrectly by jewelers who know the customer will not be buying from them. You might even go to two different jewelers to check the size for accuracy. If the jeweler is unwilling to write the finger size and width on his/her card, be cautious!! deSignet does not want to sell you a ring which does not fit properly - please have your sized checked prior to ordering - thank you. All our wedding bands are hand made, comfort fit (domed on the inside), have a continuous pattern (no sizing bar) and average 6 to 8mm in width. NOTE: We do not have a sizing bar in our bands which means that correct sizing is very important. Our rings can typically be adjusted up or down by only a 1/2 a size without distorting the pattern. A sizing bar is a portion of the ring with no pattern. This will allow for easy sizing, but remember, rings roll on the finger and a sizing bar will often be seen. This is why we do not add a sizing bar to our hand made rings. We work with sterling silver, 14kt yellow, white, rose or green gold, 18kt gold, palladium and platinum. Most pieces crafted in our shop are priced based on their final weight. Sorry no stainless steel, 18kt white, 18kt green or 18kt rose. Also, no Sterling engagement rings. Two Tone rings (i.e. 14kt yellow gold center with 14kt white gold rails) require an additional $125.00 - $150.00 per ring because of added labor and they generally run 1/2mm wider than the single tone bands. Two tone bands are only available in 7mm widths or wider. If you want a two tone effect on a band narrower than 7mm we offer custom finishes of white rhodium or 18kt yellow gold electroplating. 14kt center/14kt rails - Add $125.00 per ring - see pricing table below. 14kt center/18kt rails - Add $150.00 per ring - see pricing table below. We have recently added base metal to our product line. We reserve the right to refuse to bezel set a stone based on its hardness. Sapphire, ruby and diamond are always able to be bezel set. For our available diamonds and gemstones click here. For pricing on small gemstones click here. We will gladly source a diamond or colored gemstone for your engagement ring or special jewelry purchase. Note: We recommend the use of diamond, sapphire or ruby in engagement rings as these are the most durable. Other stones such as amethyst, emerald or aquamarine are by nature soft, lending themselves to breakage and no guarantee is given. There is no addition charge to set a stone purchased from deSignet. Visit our diamonds and gemstones pages to evaluate our current inventory or contact our diamond and gemstone department for further help in identifying that perfect stone (888-727-8266). Please note, all rings are sold as either finished product where deSignet supplies and sets all stones or as semi-mounts where deSignet supplies all side stones and the customer is responsible for supplying and having the center stone set. If you choose to have a local jeweler set your stone, we will need to know the exact dimensions of the stone so that we may supply the appropriate head. Metal composition or what is alloyed with silver, gold and platinum? Sterling Silver is composed of 92.5% pure silver with 7.5% copper. 14kt yellow gold is composed of 58.3% pure gold with copper, silver and zinc in the alloy. 14kt white gold is composed of 58.3% pure gold with nickel, copper and zinc in the alloy. 14kt rose gold is composed of 58.3% pure gold with copper and silver alloy. 14kt green gold is composed of 58.3% pure gold with silver and a small amount of copper. 18kt yellow gold is composed of 75% pure gold with copper, silver and zinc in the alloy. 18kt white gold is composed of 75% pure gold with nickel, copper and zinc in the alloy. Platinum is composed of 95% pure platinum with 5% Ruthenium or Iridium. Platinum is a very dense metal which will last for a lifetime but it does scratch easily and does not hold a bright white finish. 24kt gold is 100% pure gold. We do not work in pure silver or pure gold. CAUTION: Some people experience a reaction to the alloy material, particularly copper and nickel. Sterling silver and 14kt yellow may turn certain individual's fingers black or green because of allergy or body acidity. NOTE: We do not recommend the use of 18kt white gold because it has a higher fine gold content and therefore appears more yellowish. If you want a white or silver look we recommend 14kt white gold or platinum. Credit Cards are ONLY accepted for USA or Canadian orders. Customers are responsible for all foreign taxes and duties if shipped outside the USA. Wire transfers under $500 US require an additional $10.00 transaction fee. Please call 888-727-8266 or email us for all required information. ALL prices are in US dollars - please be sure your bank is aware of this so that the currency exchange is figured properly. No order ships without payment in full and a valid mailing address. IMPORTANT!! We must know the name of the individual who is sending the money order as well as the name the order is placed under so that we may match the funds with the correct order. We currently process our on-line order via a secure website and use Authorize.Net processing services to verify all credit card orders. In addition, we will not transfer, sell or divulge any information provided such as email addresses, billing addresses, names or credit card information. All said information is only used internally to process your order. Credit card information is purged from our database once an order is shipped. Yes, we have one store in which we create and sell our product located at 1869 Whitehaven Road, Grand Island, New York 14072 USA (Located in Western New York between Buffalo and Niagara Falls). Our regular hours are 9AM to 5PM on Monday thru Friday and 9AM to 2PM Saturdays (Eastern Time). Appointments are available during regular store hours and recommended for Saturdays. Please call 888-727-8266 to schedule your visit. Interested in visiting Niagara Falls? We are just 5 minutes away from this scenic attraction. Contact us at 888-727-8266 to let us know you will be visiting. We will prepare samples of our work and can even assist with hotel accommodations. For your convenience there is a Radisson located on Grand Island as well as in Niagara Falls, New York . See our "Come and Visit" page for directions and special room rates. Yes, we will engrave any item we make provided it is practical. We will gladly engrave the inside of wedding bands for a fee (see below). We can use script engraving on bands 3mm or wider and block engraving on bands 4mm or wider. On rings smaller than a size 8 you are limited to 20 characters. Larger sizes are limited to 30 characters. Block engraving on the inside of a wedding band is $10.00 per ring. Script engraving on the inside of a wedding band is $20.00 per ring. 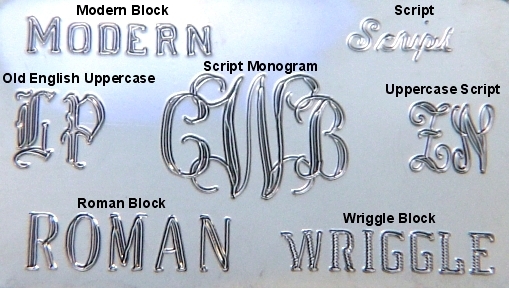 There is a $0.35 per letter fee for machine engraving on flat items with a minimum charge of $5 per item engraved. We also offer hand engraving on a per quote basis with a minimum charge of $30 per item engraved. NOTE: Once an item is engraved it is considered custom and may not be returned. Yes, you may cancel your order within three business days from the time you place your order at no charge. After three business days there will be a 20% cancellation fee. Please keep in mind that each piece is hand made which is why a cancellation fee is necessary. No, our website is our catalog. First let us understand a very basic premise. In the creation of special "One of a Kind deSign" every effort is made to eliminate confusion and dissatisfaction. Sketches and scans are created to protect us from misunderstandings regarding product weight, style and size. We also require the customer to sign off on a graphic, sketch or scan before work is begun. Custom graphics fees, rush fees, shipping and the 50% deposit on custom jobs are not refundable. Anything other than 14Kt yellow and white gold is considered custom. Products from our existing lines (stock patterns or items) are refundable less all shipping charges, foreign taxes and duties and any rush fees. There is a restocking fee of 20% on all returned stock merchandise. Custom items are not returnable. Items must be returned within 30 days of the original ship date in good condition. Good condition means that the item must not show signs of wear and must not have been altered in any way (i.e. resized or re-polished). Any item that has been engraved or resized is not returnable. A return authorization number is required. No returns will be accepted without a valid Return Authorization number or after 30 days from the original ship date. Please call 888-727-8266 for your RA number. Be sure to write the RA number on the outside of your package. Refunds are in kind (i.e. company check if paid by bank check/money order or a credit to your credit card). Wedding bands can be returned for resizing for a $20 fee plus the cost of shipping. However correct initial sizing of our bands is critical. Since the patterns repeat around the band removing or inserting material in the band will inevitably break the pattern and impact the beauty of the ring. For this reason we encourage our customers to get properly sized by a jeweler before we make the ring. Our rings are comfort fit and average between 6 - 8 mm in width. We will fax or email sketches and/or scans of the product for you. Once we receive your approval we will begin work. deSignet owns the rights to all custom graphics and custom pieces which it creates and may recreate the piece/pattern at any time. If a customer wants exclusive rights to a pattern or piece of jewelry which deSignet creates there is an additional fee of $100 - $200.00 (this is in addition to any custom graphic/mold fees) and deSignet will not use the pattern or recreate the piece. All molds and models remain the property of raru.com inc. d/b/a deSignet International. Once the graphic or sketch is approved by the customer the item is normally shipped within 2 weeks. Platinum bands require 3 weeks. All packages are insured for their full value and require an adult signature. You will be emailed when your package ships. Orders within the US - New York state residents must pay all applicable sales tax on all orders. UPS & USPS shipping price table. deSignet can not responsible for any delays caused by the shipper. Customer is responsible for paying any taxes or duties levied by the destination country on orders shipped outside of the USA. If the customer changes the shipping address after the order is shipped (i.e. when in transit with UPS) the customer is responsible for all transfer / address change fees levied by UPS. These fees range from $5 to $20 US and will be charged to the customers credit card by deSignet. Any order shipping to a P.O. Box or Military Installment must ship via the US Postal Service. We offer US Priority Mail insured (3 to 7 days) or US Express Mail insured (1 to 2 days). Please call for pricing. If you wish to ship to an address other than your billing address deSignet requires a signed release. Please print this form and fax it back to us. What if I need my order in a hurry? If you need your order in a hurry let your sales representative know when you place your order. Orders required in less than the normal 3 weeks will be subject to a Rush Charge and shipped accordingly. Please contact your sales representative at 888-727-8266 for more information. Gold and platinum wedding bands are easily cleaned. Warm a little 'Fantastic' cleaner in your microwave (use only a glass container), sit the container in a safe area and add your rings. Let the rings sit for a few minutes and then brush them gently with a clean toothbrush and rinse thoroughly in warm water. Do not put pearls, emeralds, opals and other soft stones in this cleaner. Sapphires, Rubies and Diamonds are safe. 'Fantastic' is similar to the chemicals found in store bought jewelry cleaner. The use of any product containing bleach will dissolve the solder used to bond gold and silver pieces together. When exposed to bleach your jewelry will break Please remove all jewelry before using bleach products or wear rubber gloves. All products manufactured by deSignet International are guaranteed to be free of defects in workmanship, are made of the finest materials and are guaranteed to be as described in their product description. All products are stamped with the material from which they are made (Sterling Silver, 10Kt, 14Kt or 18Kt Gold or Platinum). Any product with defects will be repaired or replaced free of charge, at our discretion, and will include a refund of all shipping charges related to said repair. All products manufactured by deSignet International are warranted for the life of the original purchaser. Normal wear of a jewelry item is to be anticipated and is not covered by said warranty. No warranty expressed or implied is attached to gemstones. Many jewelry companies require a regimented four or six month inspection schedule. Because of the distance to many of our customers and the cost of shipping, we recommend that you have a general inspections done by your local jeweler. If your local jeweler recommends service, please contact us through email or by phone (888-727-8266) so we can advise you of the appropriate course of action. If we determine that it is necessary to see the product, you will be asked to ship the product fully insured to us for inspection. Please call in advance and receive a Return Authorization Number. It is important that the RA number be clearly displayed or your package maybe refused!). Note: The deSignet warranty is immediately voided if the jewelry item is serviced by a third party without written approval from deSignet. Will deSignet work with my company or organization to develop a custom line of jewelry? deSignet International offers volume incentives to companies or organizations interested in developing custom jewelry items based on their corporate or organizational logo. Logo based jewelry items might include a dime size graphic transfer used as a pin or earrings or as the top to a signet ring or on a money clip or as a pendant. Larger graphics can be used in pins or pendants. Whether interested in providing members with quality jewelry items to enhance organizational pride or creating an additional revenue stream from a logo based line of jewelry items deSignet is anxious to work with you to accomplish your goal. deSignet offers complete turnkey solutions from product design through order administration and product shipping. When creating a custom product for your organization, deSignet requires a one-time non-refundable deposit after sketch approval. The amount of the deposit is credited against initial product orders. Custom product design from a company or organizational logo requires a clean graphic with excellent detail. deSignet International's graphic designers will gladly work with you to correct any deficiencies in the quality of your graphic. deSignet's sales representatives and jewelry designers will be glad to work with you to evaluate the many possibilities. In addition to developing a custom jewelry design we will be glad to work with you to develop a detailed business plan forecasting revenue and expenses. All molds and models remain the property of raru.com inc. d/b/a: deSignet International. deSignet International is not a wholesale organization and does not offer quantity discounts to stores, merchants or other jewelers. We do not wholesale and we do not provide quantity discounts on our stock product line. 1 to 6 pcs. 7 to 11 pcs. 12 to 24 pcs. 25 to 49pcs. 50 to 75 pcs. 76 to 99 pcs. 100+ pcs. The above discounts only apply to custom photo etched products, NOT to chains, earrings, accessories or other items in our on-line catalog. Discount applies only to like product in like metal (i.e.. 50 pair of sterling silver cuff links, 40 sterling pendants and 10 gold pendants qualify for 30% off in the s/s cuff links but only 20% off on the s/s pendants and only 10% off on the gold pendants). WE DO NOT DISCOUNT TO THE TRADE. Items may be assorted for quantity discounts within like metals (i.e. 14KT gold). Do you offer Free Sketches? Sketching is a great way for us to get acquainted and demonstrate our creativity. In most cases the sketch is a monogram, a ring or a combination of initials with a symbol and it can be completed in a few minutes. In other cases, Story Bands for example, the "Sketch" is a combination of several graphics and can be extremely time consuming. In those cases we ask for a deposit to cover the time involved putting those assorted graphics into a scaled template.